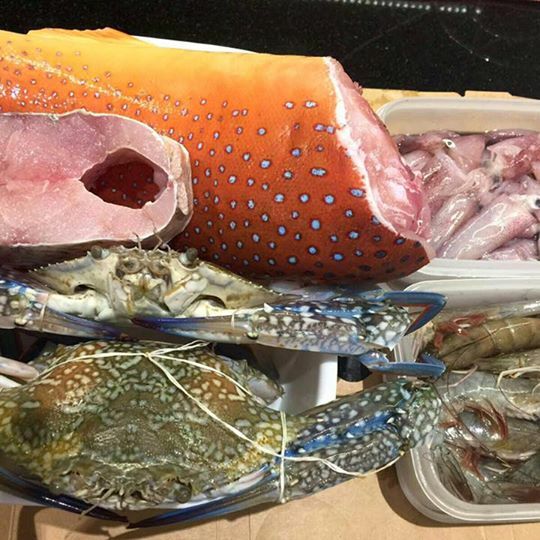 Comes with mussels, clams, prawns, flower crabs, steak cuts of a common fish, and a random component to go with the season and to keep your seafood exciting. Prawns or crabs or a combination of both. Usually comes with equal parts mussels and clams. We might occasionally have oysters or scallops and other bivalves. You subscribe to our farms, we provide you seafood. We will deliver seafood to your home once a month, on a Saturday morning, for 12 months. Your seafood will be packed nicely in freezer-friendly tupperwares, and kept chilled in a cooler box. You get keep the box and tupperwares and clean it for us. When we deliver the next month, we collect the first cooler box and tupperware set. No more plastic bags and disposable packaging. You pay a deposit equal to your monthly installment that will cover the cost of your containers. At the end of your subscription, you can choose to continue for another 12 months, or take back your deposit. We will return you half your deposit if the subscription is cancelled before the 12 months is completed. WhatsApp Marcus at +65 9489 4224 for enquiries. You can also send him the completed order form. Q: Why is the subscription for 12 months? A: So that our partner farmers and us can plan for a continuous demand for our produce. Also so that we can be zero-waste and reuse our delivery containers instead of one-off plastic bags. Q: Why do you deliver once a month? A: We've split Singapore into four zones. So we deliver to one zone a week, and cover all our subscribers over a month.